Its official title may be the Saskatoon Food Bank and Learning Centre but in conversation, you’re more likely to hear it called “the food bank”, three words that don’t touch on the many needs the Centre strives to fulfill. Yes, food hampers are a critical service, but I only learned about the Clothing Depot in the past few years and before diving into writing this, I hadn’t realized their scope of practical programming and support. Simply put, there’s so much more to this community-minded organization than food. That’s why I asked Executive Director Laurie O’Connor to please give us some insight into what goes on in that big brick building and why its services are so important to our community. I met with Laurie in the same place the food bank began in 1984, and she told me (much to my surprise) that the Clothing Depot and learning programs began very shortly after the doors first opened, that the idea has always been to help in a crisis while addressing the root causes of poverty and supporting systematic change. The emergency food hampers are for anyone who finds themselves in need of food, no judgement, and can be relied on once every two weeks. A huge team of volunteers makes the place tick (pictured above is the loveliest lady who’s been volunteering for years) and the food itself all comes from private and corporate donations. Often, a product gets a new label and the Food Bank is given the ‘old’ stock and there are large donations from grocers, too. Whether it’s a family not quite making it to the next paycheck, a student whose funds are short, or a single parent just struggling to keep their kids fed, the number of people in need of is staggering: last year alone, 85 750 food baskets were given to people who would have otherwise been hungry, the majority of them being children. The goal at the Food Bank and Learning Centre is to put themselves out of business by eliminating that need. How? With addictions counselling, emotional support, and with education. Creating Opportunities, the only government-funded programming at the Food Bank and Learning Centre, is a classroom program where people can upscale their literacy and computer skills, while its second stream is a workplace placement program that sees people doing practical work within the Centre, getting coaching, and conducting mock interviews, all of which gets them employment-ready. “I’ve seen a ripple effect in families,” Laurie told me, “You see a brother, a sister, a father enter the program.” That scope expands with every employment success. 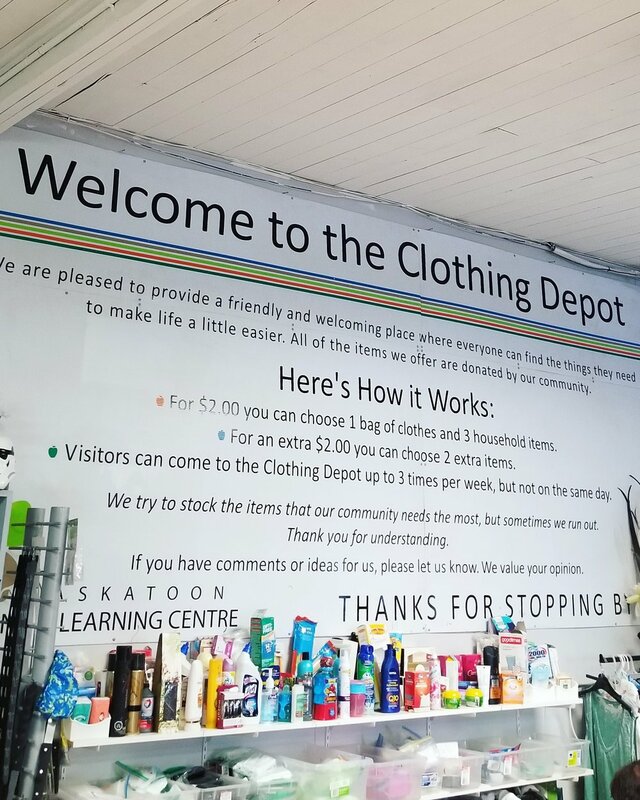 Speaking of the workplace program, one of the places in which Creating Opportunities students gain hands-on experience is in the Clothing Depot, which is set up to provide a retail shopping experience. They stock and display, do transactions, everything one would do in a store because, it is one. Clients purchase expensive-but-necessary sundry items like laundry detergent, diapers, and hygene products that would otherwise be a financial stressor, all at a small charge. And, it being called the “Clothing Depot”, there is of course clothing. Laurie said one of the things they’re consistently low on is men’s clothing, maybe because men tend to keep their clothes longer, so after my visit I asked a few neighbors if they had any men’s clothing they could part with and WOW did they come through. I’ve gotta give a shout out to Mrunmayi, Kristin, Brittany, Trish, Kerri, Tanys, Lindsay, and Carrie for their vehicle-filling donation of clothing… and of baby formula, another most-needed item. Now, I mentioned counseling is available but I didn’t mention that, in partnership with CFS Saskatoon, it is at zero cost to the clients. “There aren’t a lot of free couches out there,” explained Laurie, “and mental wellness is a real challenge for many.” It’s something anyone can access and it’s available every weekday. There’s also a volunteer-run CRA tax program available which last year alone saw $19 million dollars back in the pockets of 5000 people and families with low incomes. “That’s a LOT of money,” acknowledged Laurie, “and it all gets spent in Saskatoon.” She explained that the program is more than an accountant just doing all of this paperwork— the goal is always to help people gain independence, so Affinity came on board to aid financial literacy, walking people through doing their own taxes, moving them further ahead in the game. Other available courses are Food Fit which teaches about cooking, fitness, nutrition, and how to best use simple foods like the ones found in the hampers, and the Urban Agriculture program which you may know as the community garden beside Earl’s. 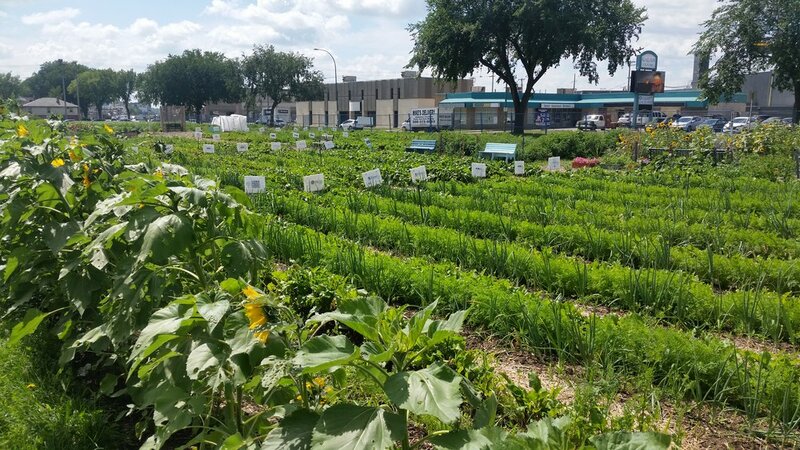 In the garden, produce for the food hampers is grown and a Gardening 101 class is put on in partnership with the U of S, the City, and Meewasin to teach what best grows in our climate and how to make it happen. Businesses can also adopt a plot where their employees volunteer their time to grow food, alongside relationships in the community. So, yes. The Saskatoon Food Bank and Learning Centre is about food. Food is one of our most basic needs. But the overarching goal of the Centre is to address WHY someone needs assistance and, as Laurie puts it, “to build assets for people.” Breaking free from addiction, upgrading computer skills, gaining practical experience, becoming financially literate, dealing with mental health, learning how to grow food, understanding nutrition…the scope of assets the Food Bank and Learning Centre aims to build is huge. And they’re doing it every day.